A blue butterfly is a breathtaking example of Mother Nature at her finest. Because of its beauty, a blue butterfly is often thought to have special meaning and symbolism for those lucky enough to see one. Although seeing a blue butterfly is not a common experience, several species throughout the world are blue—or appear to be—and each holds special significance for its admirers. There is an abundance of butterflies with blue on their wings in America, although none are nearly as spectacular as the Blue Morpho. 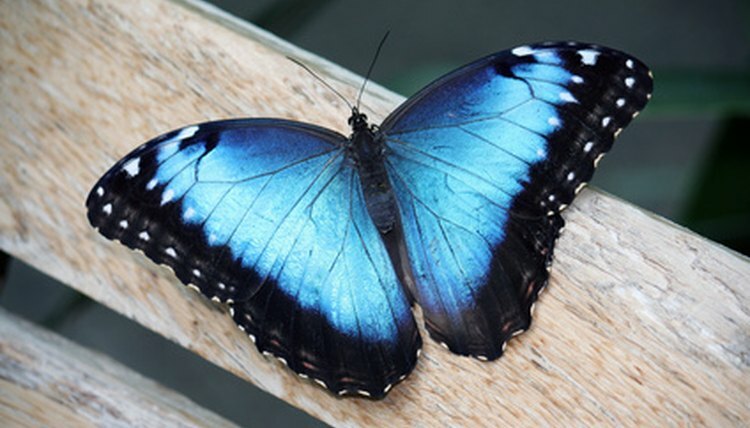 The blue morpho lives in the tropical rain forests of Latin America and is one of the largest butterflies in the world. Its wing span ranges from 5 to 8 inches and its wings are iridescent. The apparent bright blue color with wings edged in black makes it breathtaking to see. Its wings are not actually colored blue. Rather, the scales on its wing tops reflect the blue light and make the wing tops appear vivid blue. 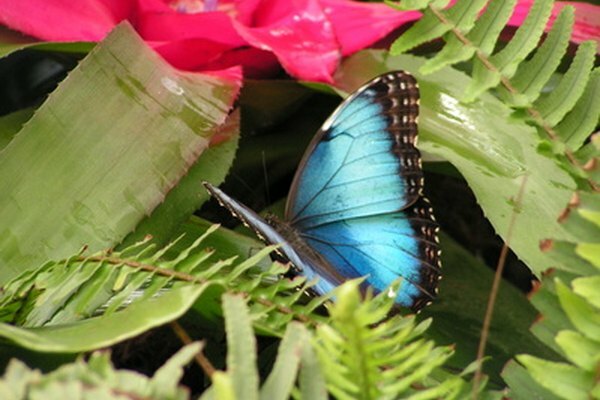 There is an abundance of beautiful butterflies with blue coloring. The United States alone has a number of species of blue butterflies. The eastern tailed blue butterfly is frequently seen in the eastern half of the United States, but it has also been spotted in California, Washington, Oregon and other western states. 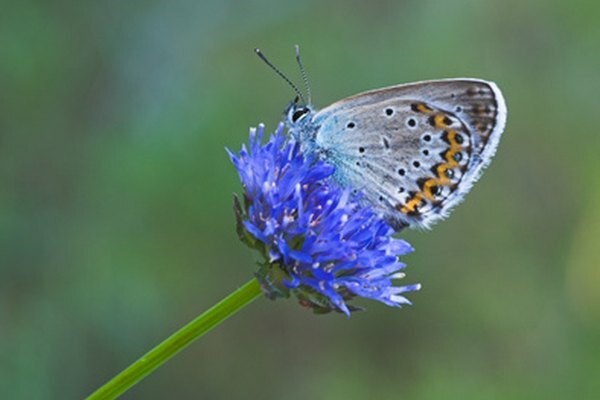 The Karner blue butterfly is spotted in the Midwest, the mission blue butterfly California, and the Pacific dotted blue butterfly lives along the Pacifc coast. Other butterflies with blue coloring include the common, Acmon, Adonis blue, canary blue, checkered and shasta, just to name a few. The Blue Butterfly, a movie filmed in 2004 about the legendary Blue Morpho, starred William Hurt. The film was inspired by true story of a 10-year-old child's dying wish to catch what he considers the most beautiful butterfly on earth for his collection. The boy is convinced that the butterfly can reveal the mystery of life to him. The movie builds on the mysticism and legends surrounding the blue butterfly, especially rebirth, coming of age, and then creating your own destiny. Butterflies are often viewed as a Christian symbol of resurrection and rebirth of Jesus Christ. Many Christian churches utilize the symbol of transformation from a human life to everlasting life. Blue butterflies are used not only for their beauty but also to convey the emotions of beauty, joy and hope. Butterflies are sometimes released at special Christian services, such as weddings or funerals, to commemorate a transformation. While the color of a butterfly often determines a particular folklore, sometimes it is just the spotting of a butterfly in general and not of a particular color that determines a belief or cultural symbolism. Butterflies of all colors—not just blue—often evoke emotions of beauty, freedom, a change of season, joy, femininity, nature and earth elements such as water and fire. Butterflies are used in art to showcase beauty and depict nature and the symbol of a butterfly remains a top fashion favorite with women. In decorative cases, the color of the butterfly is simply chosen to coincide with a particular color favorite and not a specific meaning.